Connecticut met an initial goal of reducing greenhouse gas emissions to 1990 levels by 2010 and is on track to meet the next goal of going 10-percent those levels by 2020, according to a progress report issued Friday. “We know that greenhouse gases are in fact affecting our environment, at least we believe that in this part of the country, and have precious little debate about it, I might add,” Gov. Dannel P. Malloy said. The state Department of Energy and Environmental Protection released the report at Crest, a heating-and-cooling company in Hartford that spent $145,000 to install rooftop solar energy panels that are saving the firm $22,000 annually. 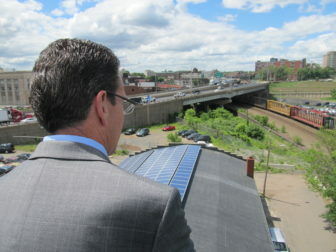 Solar energy is growing in Connecticut, but the biggest reduction in carbon pollution came from the state’s shift from coal to natural gas to produce electricity. Emissions in the power sector have dropped 31 percent since 1990 and 22 percent since 2005. The progress report is required every three years under the Global Warming Solutions Act of 2008, which mandated that Connecticut reduce greenhouse gas emissions to 80 percent of 2001 levels by 2050. The report comes days after the Obama administration proposed an Environmental Protection Agency regulation aimed at cutting carbon pollution from the nation’s power plants 30 percent from 2005 levels by 2030. The federal government trails the efforts of nine Northeastern and Mid-Atlantic states that belong to the Regional Greenhouse Gas Initiative, or RGGI, the nation’s first market-based regulatory program to control carbon emissions. Gina McCarthy, who is Obama’s EPA administrator, was the commissioner of environment protection in Connecticut during the administration of Malloy’s predecessor, Republican M. Jodi Rell. She helped develop RGGI. “Today’s report has encouraging findings about Connecticut’s progress thus far on reducing greenhouse gas emissions, but it also shows just how far we have to go,” said Lauren Savidge, staff attorney and energy specialist at Connecticut Fund for the Environment.